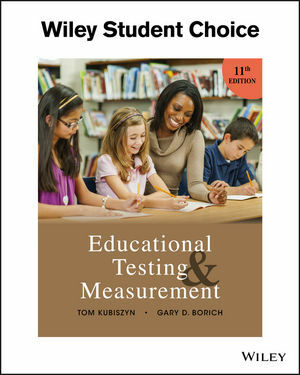 Educational Testing and Measurement: Classroom Application and Practice, 11th Edition by Tom Kubiszyn and Gary D. Borich, serves as an up-to-date, practical, reader-friendly resource that will help readers navigate today's seemingly ever-changing and complex world of educational testing, assessment, and measurement. The 11th edition presents a balanced perspective of educational testing and assessment, informed by developments and the ever increasing research base. New Incorporates recent and existing state and national educational reforms to inform readers about the way they have influenced testing practice. The authors describe how the Common Core State Standards (CCSS) have evolved since the last edition. They integrate the state-sponsored CCSS with the national Race to the Top (RTT) voluntary initiative and the RTT sponsored multi-state assessment consortia (i.e., the Smarter Balanced Assessment Consortium and the Partnership for the Assessment of Readiness for College and Careers, or PARCC). Highlights traditional and contemporary topics and provides examples that deal with practical, day-to-day issues related to the testing and assessment of students and measuring their behavior, in the context of NCLB, state high stakes testing programs, IDEIA, RTI, the CCSS, and the RTT initiative. Presents both sides of the various controversies around educational testing and assessment in hopes of enabling readers to be informed enough to form their own opinions. Complex test and measurement content is presented in a nonintimidating and unique manner, and related back to important developments in educational measurement and assessment.